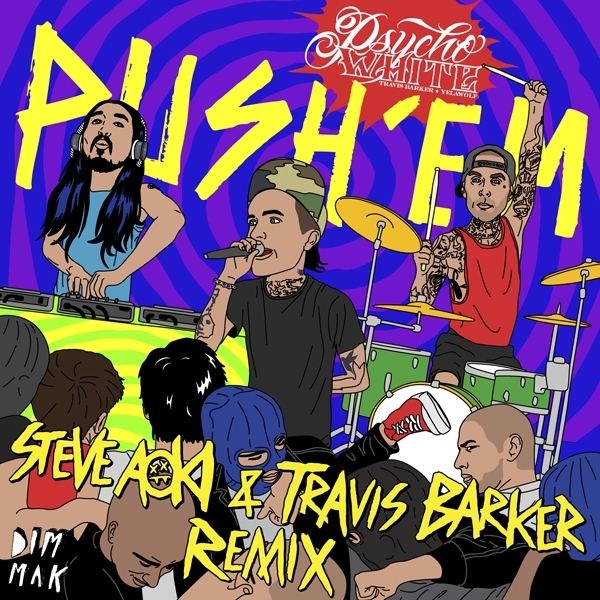 Ubiquitous drummer Travis Barker and electro master Steve Aoki have joined forces on a remix of "Push 'Em", a track from Barker and rapper Yelawolf's 2012 EP Psycho White. "Travis Barker is hands down my favorite musician to work with," Dim Mak label founder and veteran remixer Aoki tells Rolling Stone. "Whether it's original material like we did on 'Misfits' or 'Cudi the Kid,' or doing this remix for his group. . . [Barker] has the best vocal samples to use for a stomping club record." Barker was the catalyst for the fun remix, and sought out Aoki for it. "The song had such a crazy energy/angst as it was," says Barker, "and I could just imagine how Aoki could flip it. [His remix] gives the song the nastiest bounce I would've never expected." From the first bass-heavy note, the aggressive reworking conjures a late-night, glowstick-filled warehouse rave with its buoyant rhythm and catchy-yet-eerie EDM dissonance. Yelawolf's commands to the audience to move — "Tall people in the back/ Move to the front/ Small people in the front/ Move to the back"— take on a new urgency in the electronic mood. "It's always interesting for me to work with live drums and my kicks and snares that I generally use, so it was a fun one to remix, especially with Travis' flow," says Aoki. "And this song is in triplets, so drum rolls and unique drum work is a must. You get the hip-hop swagger, punk attitude and bass in yo' face." The remix will be officially released by Dim Mak on August 13th.